Abstract—This research investigates the importance of costing element in sustaining the coastal management initiative in Selangor, Malaysia. Thus, this research stems from the approach of financing coastal management to see the importance of budgeting in planning and managing coastal areas. The research attempts to examine and analyse the relationship between the implementation of coastal management and the costing impact. The study was undertaken in Klang District, Selangor based on data collection from interviews, consisting of government officials and coastal management practitioners, apart from obtaining secondary data from literature review and governments’ documents. The results demonstrate that the level of success of implementation of coastal management programme is based on its approved costing. In a local context, the results indicate that the relationship between costing and coastal management has a positive pattern but does not establish a strong relationship, whereby the costing index is only 0.195 (the third ranking place). This situation shows that Selangor state does not emphasise on the importance of costing element in managing its coastal areas. This is due to the lack of attention given to the importance of coastal management in relation to the holistic approach of development practised in Selangor. Index Terms—Costing, coastal management, relationship, Selangor. The authors are with the International Islamic University Malaysia, Malaysia (e-mail: zainora@iium.edu.my, tuminah01@gmail.com). 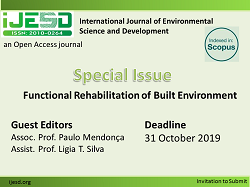 Cite: M. Zainora Asmawi and Tuminah Paiman, "The Importance of Costing in Coastal Management: Experience of Selangor, Malaysia," International Journal of Environmental Science and Development vol. 7, no. 2, pp. 117-121, 2016.